← Does the Euthyphro dilemma actually prove anything? Joshua Brown has a sobering editorial on the state of our understanding of the brain. Warning: it requires some familiarity with how a computer works to understand his point: Frontiers | The tale of the neuroscientists and the computer: why mechanistic theory matters | Brain Imaging Methods. 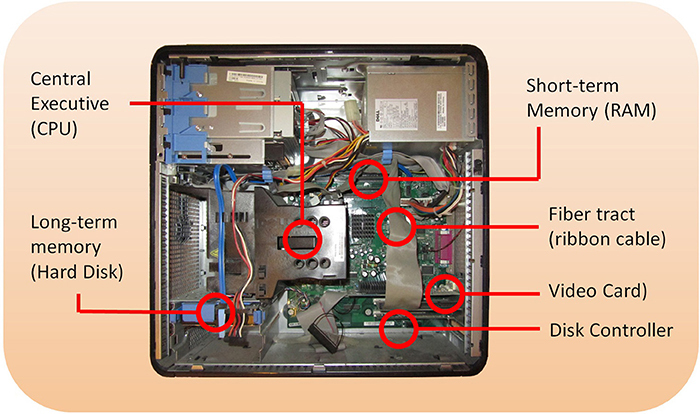 Once upon a time, a group of neuroscientists happened upon a computer (Carandini, 2012). Not knowing how it worked, they each decided to find out how it sensed a variety of inputs and generated the sophisticated output seen on its display. The EEG researcher quickly went to work, putting an EEG cap on the motherboard and measuring voltages at various points all over it, including on the outer case for a reference point. She found that when the hard disk was accessed, the disk controller showed higher voltages on average, and especially more power in the higher frequency bands. When there was a lot of computation, a lot of activity was seen around the CPU. Furthermore, the CPU showed increased activity in a way that is time-locked to computational demands. “See here,” the researcher declared, “we now have a fairly temporally precise picture of which regions are active, and with what frequency spectra.” But has she really understood how the computer works? Strangely enough, I actually found this thought experiment somewhat encouraging. Sure, the hypothetical researchers don’t fundamentally understand the electrical engineering of a computer, but I was struck by how much they could understand just be using the neuroscience techniques. Our understanding of the brain has a long way to go, and I’m pretty sure that there won’t be one simple model breakthrough that gives neuroscientists the electrical engineer’s understanding of a computer, but a long series of conceptual steps that will have to be climbed, with a lot of surprises still left. This entry was posted in Zeitgeist and tagged Brain, computational modeling, EEG, fMRI, methods, Mind, Neurophysiology, Neuropsychology, Neuroscience, Science, Theory. Bookmark the permalink.